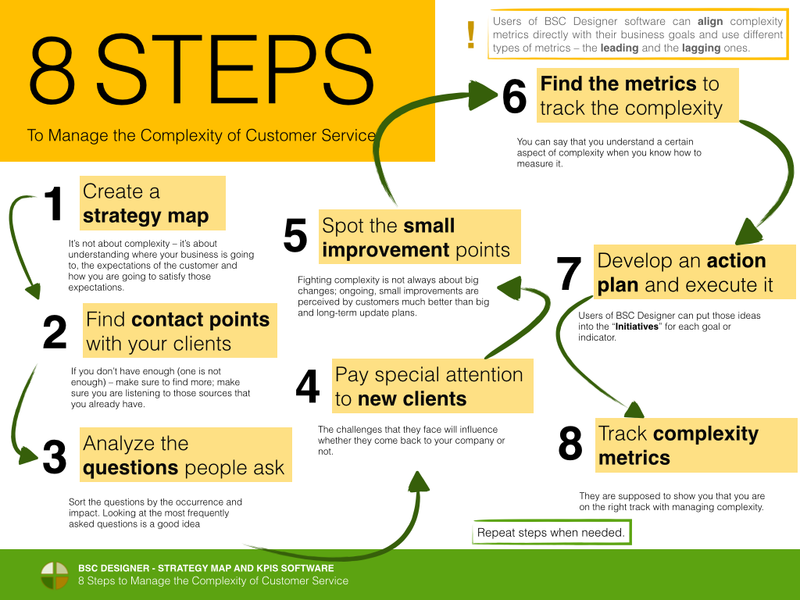 Following up with the ideas about complexity metrics discussed in the previous article, let’s now focus on some examples of complexity applied to the customer service domain. The importance of customer service is crucial to retaining clients. One month, I had to deal with two repairs services covered under warranty – one for a Nespresso coffee machine and another for my laptop. The laptop experience was “OK,” but the Nespresso experience was excellent. What was the difference? The coffee machine was picked up by a transportation company (that time I was living in Barcelona) that brought a special hard case for that very model. I’ve also got a replacement for the time of repair. The laptop experience started with packing a laptop in several layers of protective paper (my responsibility to ensure that it will safely get to the repair shop) and finding some old laptop as a temporary replacement. How can the complexity in the laptop example be detected? Well, it’s easy – there was an instruction text which mentioned several times the importance of packing the laptop well before sending. I could deduce that many people failed to pack their laptops well and that resulted in that long instruction. When you have to write a two-page text just to explain how to send the product – it feels like a complexity issue. Time a client needs to pack the laptop well (including buying the materials)? This complexity for laptop repair could be managed in the way Nespresso did it for their coffee machines, or they could simply allow the customer to get the laptop directly to the repair shop. Another example that can demonstrate a different approach to managing complexities is car renting in the Canarias. The best practices in this example come from local company, Cicar. The negative experience comes from one of the world’s known car renting brands. At Cicar, you don’t pay upfront, and they have all reasonable insurances included in the price (so you don’t need to note all minor scratches in the car renting contract before signing it) they allow you to travel between islands; they charge you a deposit for the fuel and refund immediately when you return the car. If you return with more fuel than you had when you picked up the car – they will compensate it for you. The “big brand” renting company did not bother about eliminating complexities for the customer. The insurance by default is with a significant franchise, so most clients prefer to mention all the scratches in the contract to avoid problems when returning. You have to return the car with the same level of fuel, and they needed four months and a number of calls to customer service to get money back to the card. How did Cicar learn to be so good? I guess this is a great “wearing customer shoes” example. They simply eliminated things that normally make you crazy when you have to rent a car, plus, their focus is on the Canary Islands so they can use 100% of the specifics of the market. How can we detect and quantify similar situations? What are the most frequent problems mentioned in the testimonials and asked to customer support? Besides recording negative feedback, one needs to develop a response plan to detect and eliminate similar situations in the future. It’s important to focus your attention on those who are clients of your business for the first time. One dentist practice was located in an elegant building with high tech equipment and professional personnel. The only visible issue that they had was the doorbell – it was located three meters from the entry door. So, any first-time client was somewhat nervous when he/she saw the closed door, but no doorbell. Those who came for the second time already knew where to find the doorbell, and it was not an issue for them. Look at those who have just started to use your product or service, and they will help you to detect “doorbell” issues. A similar problem happened to me like the car renting case described above. It was clear from my confirmation email that the office of the renting company was supposed to be in the Arrivals zone of the airport, but it wasn’t there. Neither was a sign or a shuttle bus to get to their office. Not an issue, if you know that you have to do this, but it was a kind of negative experience for the first time. How can you detect complexities that first-time customers face? The most obvious idea works well – observe the behaviour of new customers, try to talk to them and get fresh impressions. In the 10 Step KPI system book, we compared observation and direct interaction, so don’t trust just one method. How can you quantify complexities for first-time customers? Most likely, you will start with similar metrics as for normal customers, so the first step is to copy and paste the standard metrics (in BSC Designer, you can copy the whole scorecard if needed) but apply them specifically to the new customers. What is a good metric for a doorbell case? We could come up with some, but I´d say that this is the case when it’s easier to fix the problem than trying to understand if/how it impacts the business. In the case of car renting, the simplest quantification would be the number of negative feedbacks. Should there be 10 negative feedbacks in public, consider that there are x10 times more unseen. Let’s discuss another case that is a good illustration of how potential customers quantify (intuitively) service quality. I experienced this when we had to choose a hosting provider for a dedicated server. The market offered a number of options that satisfied budget and technical requirements, so the choice was not about price/features. Filtering out marketing testimonials that companies usually put on a website, we noticed that one company appeared many times on our radar. It was Future Hosting. They were really good in customer service. We learned that from several forum posts by their current/old customers, then we tested it ourselves with some quick questions and finally, we confirmed this during a test period. Time to answer a support query. A benchmark depends on the nature of your business. I mentioned Future Hosting responded quickly (“We’ve got your message, and we are looking at your problem,” and it was not an auto response) and get most problems solved within a few hours. Query resolution success rate. e.g., how often do you have to tell your clients that you cannot help with this because it is out of the scope of your business? They buy right away without even trying (we provide a free 30-day trial, but someone could buy directly because they used the software before working for another company). Their trial period expires (as there is a need to get approval to buy new software), and they buy afterwards. We were looking at how customers were getting through the registration process, and we found a complexity – different users had different ideas about what to do with the registration code that they received. The metric that we used to detect this complexity was the number of customer support tickets related to this issue. Gives instructions to a customer (that are specific for that very case and translated to the customer’s language) about how to use the subscription code. The mentioned script was nothing special from a technical point of view, but our metric (the number of customer service queries of a specific type) showed that this was no longer an issue. From the previous cases, it might look like complexity is something difficult to manage. In many cases it is; it’s hard to organize a pickup of a laptop for repair while taking into account the variety of models and sizes; it’s hard to create a clear offer of car renting when there are insurance and bad driving involved. However, there are always small improvements that could make a big impact on how complexity is perceived. Here is another case – a parking reservation at an airport. The whole process was relatively painless, except the final step – the confirmation email. The email said that it is recommended to print it “just in case.” The issue was that the email was four pages long. The need to print, and moreover, to print four pages is enough complexity for me (see the thoughts about the definition of complexity in the previous article). Pick the one you like more: time spent on printing, the number of trees killed, CO2 emission. The solution? Remove unnecessary rubbish from the reservation (or put it on the second page so that I could print just the first one)! Changing the email template can be done in less than one hour. Do you want to create an even better experience? Then get the reservation delivered on a smartphone in the pass format. It’s not a big deal from a technical point of view, but it will make a tangible impact on how the whole service is perceived. Create a strategy map. It’s not about complexity – it’s about understanding where your business is going to, the expectations of the customer and how you are going to satisfy those expectations. If you are new to strategy maps, use this free Strategy Map Wizard to get started. Find contact points with your clients. If you don’t have enough (one is not enough) – make sure to find more; make sure you are listening to those sources that you already have. Analyze the questions people ask. Sort the questions by the occurrence and impact. Looking at the most frequently asked questions is a good idea. Pay special attention to new clients. The challenges that they face will influence whether they come back to your company or not. Spot the small improvement points. Fighting complexity is not always about big changes; ongoing, small improvements are perceived by customers much better than big and long-term update plans. Find the metrics to track the complexity. You can say that you understand a certain aspect of complexity when you know how to measure it. Users of BSC Designer software can align those metrics directly with their business goals and use different types of metrics – the leading and the lagging ones. Develop an action plan and execute it. Users of BSC Designer can put those ideas into the “Initiatives” for each goal or indicator. Track complexity metrics. They are supposed to show you that you are on the right track with managing complexity. Repeat steps when needed.